Winner of four Academy Awards including Best Picture, Chariots of Fire is the inspiring story of Eric Liddell, Harold Abrahams and the Olympic team of 1924, who brought Britain one of its greatest sporting victories. This internationally acclaimed film came back on the big screen in a brand new digitally remastered version in July 2012 as an official part of the London 2012 Festival celebrations. One scene in the film depicts Liddell falling early in a 440 yard race in a Scotland–France dual meet and making up a 20-yard deficit to win; the actual race was during a Triangular Contest meet between Scotland, England and Ireland at Stoke-on-Trent in England in July 1923. Liddell was knocked to the ground several strides into the race. He hesitated, got up and pursued his opponents, 20 yards ahead. He caught the leaders shortly before the finish line and collapsed after crossing the tape. This scene was filmed at Goldenacre Stadium on Inverleith Row in Edinburgh, the playing fields of George Heriot’s School in Edinburgh. Other International race meet in pouring rain, filmed at Inverleith Stadium on Ferry Road, Edinburgh playing fields of Daniel Stewart’s & Melville College in Edinburgh. Preaching in church on the day of the 100m Olympic final, filmed in Broughton St. Mary’s Parish Church in Bellevue Crescent, Edinburgh. Liddell’s chat to his sister Jennie with Edinburgh skyline behind, at Arthur’s Seat in Edinburgh, below East end of Salisbury Crags, close to the end of Holyrood Park Road. Harold Abrahams and Sybil Gordon in restaurant, filmed in The Cafe Royal Bar & Restaurant in West Register Street, Edinburgh. 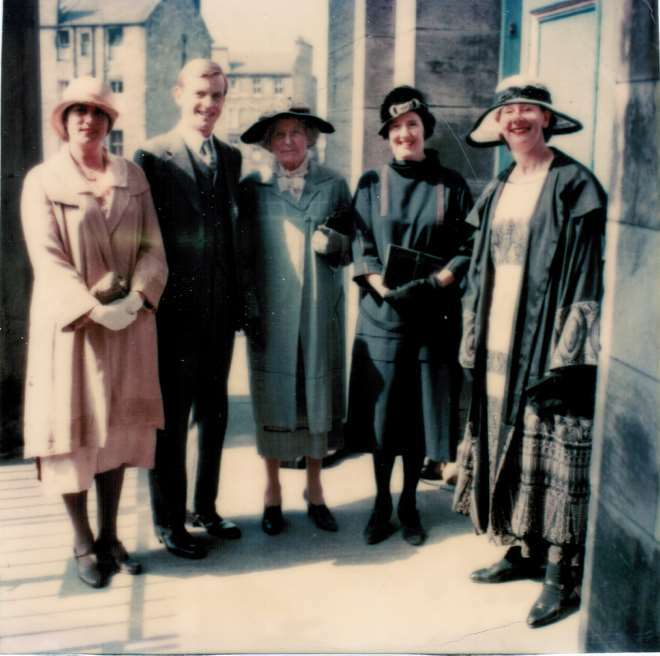 This photo from the Liddell family photo books shows Iain Charleston (Eric Liddell) with from l-r, Sue Caton, Iain, Jenny, Joan and Roseme Liddell. Article from “The Week”, used with permission.